The Cultural Olympiad is a cultural celebration of the history of the modern and paralympic movement and is running alongside the Olympic games.The cultural celebrations involve art projects, music and dance performances, mass choirs and film presentations. With Weymouth and Portland being the second largest venue outside London many of the events are taking place here. My favourite art project is the Olympic deckchairs, 500 deckchairs have been designed by local residents and the new deckchairs can be found all along the promenade in Weymouth. I love the colours and designs - aren't they special and fun! We have also had the Big Red Ball visiting the town, This is a large scale art project on squashing a big red ball into a familiar place. Everyone was having fun capturing it on camera and reaching out to touch it! An island has suddenly appeared out in the sea in Weymouth bay it is ""Nowhere Island", another art project that celebrates our island nation and tries to make people think about if they found a new island, how would they like to live there and what laws would govern their lives. It will be visiting other places in the South West over the next month. The island was still be being put in position when we saw it. Weymouth has had a new relief road and a new sculpture called " Jurassic Stones" was created as part of the Olympiad celebration. The stones were unearthed while the relief road was being constructed. There was an outcry locally when it was revealed that the price of the installation was £332,291. It was paid for by the Arts Council. And finally the "Battle of the Winds" is a story of how the winds from all over the South West are bought to Weymouth to help the Olympic Sailors have good sailing conditions over the forthcoming weeks. 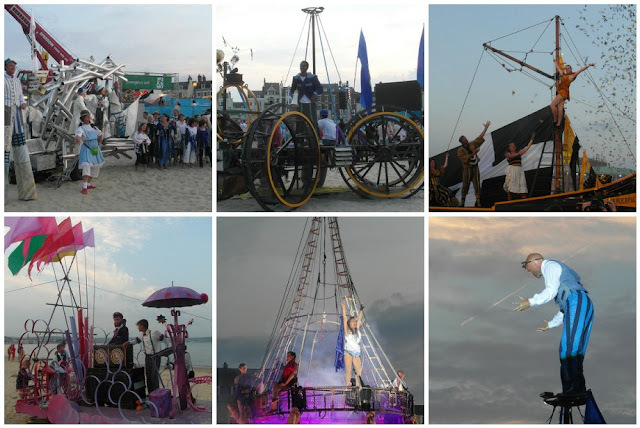 This is told by song, dance, street theatre and aerial acrobatics. It is an amazing spectatular. I hope everyone enjoys the Olympics. For the competitors it must be the highlight of their career. Part of the Olympics is to encourage and celebrate the friendship of nations. I think we do that so well in the blogging world and I would like to say a big thank you to my oversea followers and others who read my blog from other nations. I never anticipated when I originally set up my blog 9 months ago that I would have so many overseas visitors and I love communicating with you with assistance of google translate (!). This for me has been one of the highlights of writing a blog. Hello and welcome to new followers Nina, Tales from my craft room and Stone Hedge Farm, it's wonderful to have you on board! What a great collection of things! I've read about the island and the red ball in the news. The deckchairs are fab, I love the birdy fabric in that third photo. I'd love to spend an hour sat in one, watching the sea! There was so many great designs, it was difficult to decide which ones to photograph! Such extraordinary and wonderful things going on around you in Weymouth. We love the deckchairs and think that all the new pieces of art work are so very imaginative. So much going on there. What a great imaginative idea to make an island. The deck chairs are stunning, such super designs. everyone has taken part. This post is excellent Sarah, I enjoyed reading more about the olypics from someone in GB.and also outside of London. our coverage here is limited. I love the deck chairs and the red ball - what fun! i love the deck chair art! they look great all lined up on the promenade. we're enjoying watching the olympics right now. glad the weather is good there. Very exciting times for your country. : ) I'm trying to watch as much of the events as possible. I planted 3 cucumber plants because my Daughter was going to be home for the summer and her and I love them. Of course we have given many away too. I'm getting my list and see what I want to sow in September for Spring. I think more flowers this time. Have a good day. I loved all your photos. The colorful chairs are so inviting. The red ball project sounds fun and the Jurassic Stones are amazing. All the street names in our little beach community have a British influence. We have friends living on Weymouth, Bath and Cornwall. Our street was New Brunswick, but it has been shortened just to Brunswick. Weymouth is so colourful and exciting and I love how your embrace the arts. The island certainly arouses ones imagination. I love it all and the red ball must bring smiles to faces. the olympic fire is soooo amazing....thank you all britains for the great, great, great show for the opening. Every day we see so often the games and I am pleased with the great hospitality!!!! I love seeing what is happening around the Olympics via your blog. We got up nice and early to watch the opening ceremony. I loved the Queen with James Bond and her Corgis! I don't remember laughing so much at any opening ceremony, it was great to see. I love the deck chairs! I bet they are very much desired to take home afterwards! Thank you for your support on my food intolerance diet. I'm feeling very frustrated as the doctor who put me on it has advised incorrectly so instead of being halfway through I should be finished. But I've moved to a new specialist and hope this is all over in a couple of weeks. I loved this post and how exciting this is happening on your door step Sarah!! Weymouth looks wonderful and vibrant! (loved all the art) especially the deck chairs!! Wasn't the opening ceremony fabulous and didn't it make you feel so British and proud!! I agree about the Queen and the Corgis, with James Bond....BRilliant!! Loved the humour!! And yes I know what you mean about the 'Blogging community' It is lovely to be part of it, as you meet such nice folks on here!! That art is amazing and the big red ball did make me laugh out loud, but I think my favourite has to be the deckchairs. In Margate, just before the Olympics a boat sailed in that was made out of all recycled, donated things like guitars and such like. It looked amazing. What great fun you are having, and how lovely to be so close to all of the action. Those deck-chairs are a joy. wow i love those deckchairs how fun! What great installations! I love the big red ball and Jurassic stones.